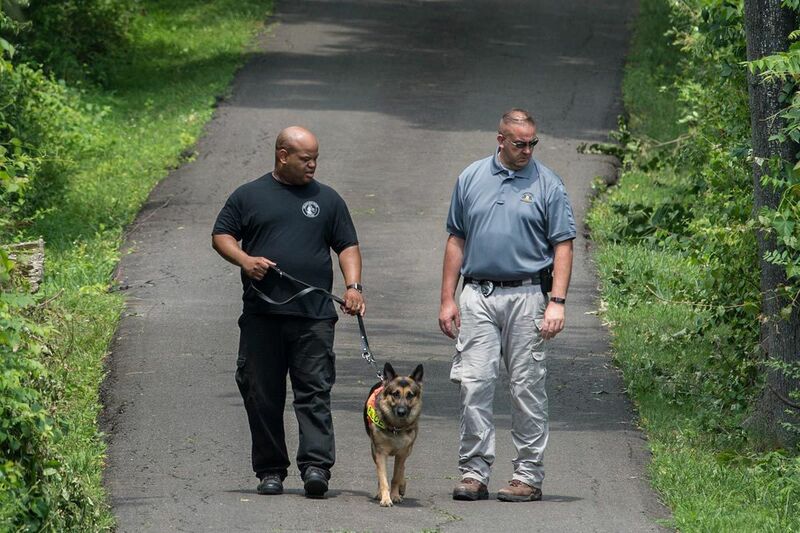 How did cadaver dogs detect Bucks County bodies 12 feet underground? A Philadelphia police K-9 cadaver dog is taken for a walk down the driveway of the DiNardo family farm in Solebury Township. The search for four missing men in Bucks County this week spread far — an overgrown 90-acre property — and deep. It ultimately led investigators 12 feet below the ground after dogs picked up the scent of human remains. "I don't understand the science behind it, but those dogs could smell these poor boys 12½ feet below the ground," District Attorney Matthew D. Weintraub said after the grim discovery was announced in a midnight news conference that spilled into Thursday. "It is a science," said Mark Hopkins, chief of Greater Philadelphia Search and Rescue. "It is also a bit of an art because it is interpretive." Hopkins' team, which was not involved in the Bucks County search, has three trained cadaver dogs. Over 40 years, the all-volunteer group has responded to more than 100 searches for human remains, Hopkins said. The main house and barn of the DiNardo property in Solebury where investigators have been searching for the missing men. Hopkins speculated that the "abundance of tragedy" in the Bucks County case, along with the hot July temperature, loose soil, and probably some trace evidence at the surface, combined to boost the dogs' ability to get a hit 12 feet underground. While biology plays a huge role – dogs' snouts are hundreds of thousands of times more sensitive than humans' – the handler is arguably the more important partner on the team, Hopkins said. Handlers need to be in good physical shape to keep up with their dogs. They need to keep an open mind, be able to follow orders, and participate in twice-a-week training, he said. They also need to trust their dog and pick up on signals when the dog makes a hit, he said. Most train their dogs to signal them by sitting, jumping on them, or barking, he said. That training is not pretty, Hopkins said. Handlers purchase scents to simulate the smell of decomposing remains. They also collect samples of soil from crime scenes like the one in Bucks County to use in training — only after the scene is cleared by law enforcement and proper permission is obtained, he said. "We bury it, elevate it, and put it in water," Hopkins said of the training process. They also put it into concrete. Some dogs only search on land, while others can traverse land or water. "Just like humans, some don't do boats," Hopkins said. What keeps dogs from hitting on the scent of a dead squirrel or chicken parts in the garbage? Their noses are sensitive enough to distinguish the different acid breakdowns of different species, Hopkins said. Dogs have been known to hit on remains that are a hundred years old, he said. For example, one of their dogs recently located the body of one of the 57 Irish railroad workers buried in Duffy's Cut near Malvern — in the 1830s. The excavation efforts at Duffy's Cut have involved everything from dogs to ground-penetrating radar. Hopkins said the rescue team treated that search like any other, but the result was still surprising. "I was amazed at that. A lot of time had passed," Hopkins said.